Savant is offering home owners more flexibility in managing our lighting, with the introduction of its Wi-Fi smart lighting control system. SmartLighting can be used as both a standalone lighting control platform or as part of a complete Savant automation system. Each Wi-Fi keypad has its own dimmer that let you manage it individually from your phone app or as part of a larger Savant home control system. "The elegance, simplicity and versatility of Savant's Wi-Fi 802.11 lighting products make lighting control a viable option for a broad new category of consumers. Now, the luxury and convenience of sophisticated and scalable lighting control can be achieved by leveraging an existing Wi-Fi network," explained Jim Carroll, Executive Vice President Corporate Strategy & Business Development at Savant." According to Savant once the switches are connected to the main it becomes become a powerful and secure networked device. In addition the smart lighting switches are able to communicate it energy usage in real-time with your in home energy management device. The complete solution features: a Wi-Fi Wallbox Dimmer which controls the lighting load, all its buttons are programmable offering scene control, motion sensors and the ability to control remotely. The Wi-Fi Wallbox Switch, it provides the on/off control of the lighting load and has the ability to function as a standalone for local control. 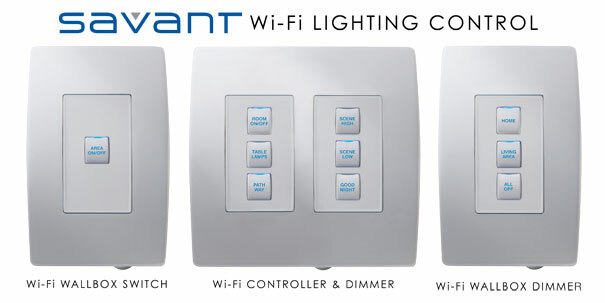 The Wi-Fi Lighting Controller is the wireless lighting controller, it can connect up to 255 Savant WiFi devices. Other components include the Wi-Fi Lamp module, LiteWare a designing and programming software and SmartConnect, an iOS configuration app.